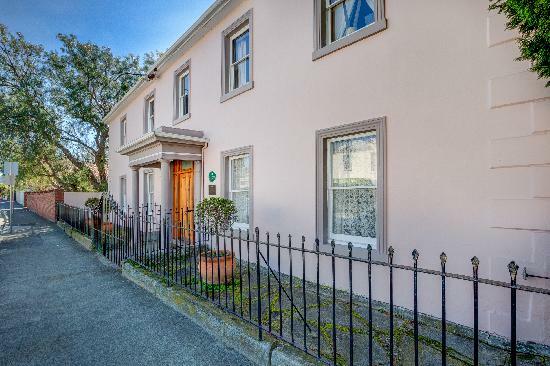 Within one of Hobart?s gracious old waterfront homes, c1840, Maison del Maroffers absolutely delightful 2 bedroom apartment accomodation located in one of Hobart?s most desirable residential areas, Sandy Bay. Very well appointed, comfortable and roomy 2 bedroom apartments, located in one of Hobarts gracious georgian waterfront mansions, which have been newly renovated and are tastefully decorated with a nice blend of antique and modern and original art works. The Maison del Mar is close to everything that Hobart has to offer and features numerous guests facilities including free car parking, bbq, garden, 24 hour reception and babysitting service. Very well appointed, comfortable and roomy 2 bedroom apartments, located in one of Hobarts gracious georgian waterfront mansions, which have been newly renovated and are tastefully decorated with a nice blend of antique and modern and original art works. Ideally situated in a perfect location with beach at back door, bus stop at front door, a gourmet delicatessen across road, excellent restaurants, university, casino and city close by. The Maison del Mar offers a well located base to explore Southern Tasmania. Perfect for an intimate escape, romantic getaway or a family retreat. . Nearby Attractions : Wrest Point Casino - 1 km, Salamanca Place – 2 km, Salamanca Market– 2 kms, Battery Point – 2 kms. Also nearby is the Hobart CBD, Constitution Dock, The Theatre Royal, Hobart's restaurant and cafe scene. Nutgrove Beach less than 50 metres from back door, the Tasmanian Art Gallery (free entry) and Allport Gallery, Huon Valley, the galleries of Hobart and all the wonderful tourist attractions of Southern Tasmania including Port Arthur are close by. 2 Bed Garden Apt : Sleeps up to 6 guests on 2 Queen Beds. 2 Bed Water View Apt : Sleeps up to 6 guests on 2 Queen Beds.